LaRoche looks to finally get his chance at the major league level (Matt Bandi/Flickr). Every once and a while we inexplicably come across an athlete that we like for no particular reason. We don’t know why or where the infatuation comes from, it’s just there. It’s even more of a head scratcher when this player doesn’t even play for your favorite teams – or even anywhere near you. There’s just something about the player that you feel some sort of weird bond with that causes you to follow him closely from afar. Hopefully I’m not in the minority here, otherwise this probably sounds a little creepy. My strange attachment began as I was reviewing year end stats of minor league players at the conclusion of the 2005 season. I was sifting through the endless compilation of stats and one player happened to catch my eye. 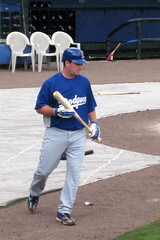 He was a young converted third baseman named Andy LaRoche who happened to have his coming out party in 2005 as he tore through A+ and AA ball for the Los Angeles Dodgers system hitting .305/.374/.553 with 95 runs, 30 homers and 94 RBI in only 127 games. I was very impressed and wanted to know more. LaRoche had a great swing and a fantastic approach at the plate. I was hooked. Entering the 2006 season I did my best to follow LaRoche from afar (via video and stats), but of course life takes you in different directions and I started pouring more of my baseball time into writing for The Diamond Cutter which I was moving from MLBlogs.com to WordPress. But our story doesn’t end there. Our paths crossed again following the 2006 season while I was working on my first top 25 prospects list and reviewing all my notes and devouring everything I could on each of the top prospects in the game. This was a daunting task as all the notes I had taken on prospects at the time were a jumbled mess and hadn’t been organized like I do now (this was in the very beginning of The Diamond Cutter’s prospect coverage and I really had no rhyme or reason to any of my notes). Needless to say this was not a fun time. The Dodgers never gave LaRoche a chance (wallyg/Flickr). But as I came across my notes on LaRoche from footage I had watched, I was quickly brought back to how impressed I was with this kid. I had periodically tracked his progression through the previous season but did not know how he finished up. At the time I remembered how well he had done throughout the 2006 campaign and was happy he was building on his strong numbers the year before. LaRoche definitely had another strong year at the dish posting a .315/.410/.514 line with a slight decrease in power with 19 homers and 81 RBI. But despite the decrease in power, he had shown a lot of improvement in his plate discipline and pitch selection. He split time between AA and AAA and saw his OBP jump 36 points, his walks go from 51 to 66 and his strikeout totals drop from 92 to 64. LaRoche was starting to show what type of player he was – more of a pure hitter and less of a masher. Needless to say I included LaRoche in my top 25 prospects list before the start of the 2007 season ranking him #20 overall and had him the top prospect in the Dodgers organization. I was officially back on the LaRoche bandwagon. So with my backing of LaRoche back in full swing, I was ready to follow him closely as much as possible on MiLB.TV and anywhere else I could get video. While I did this through the 2006 season, it was much easier to obtain in 2007 and would help me get to know his game even more. 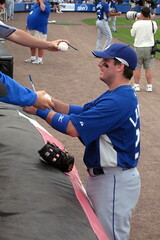 LaRoche started 2007 with his second invitation to spring training with the Dodgers. After a strong spring training I figured there was a good chance he would be able to make the big league club. I kept a close eye on the situation but ended up being wrong as LaRoche would start the season in AAA only to be called up for his Major League debut about a month later against the Atlanta Braves. LaRoche would pick up his first big league hit with a ground rule double off Kyle Davies but would soon be sent back down to AAA. This was the first big instance that I questioned the Dodgers dedication and valuing of LaRoche. In an odd decision, LaRoche would spend the rest of the summer in AAA posting a .309/.399/.589 line with 18 homers and 48 RBI until being recalled during the September call-ups. 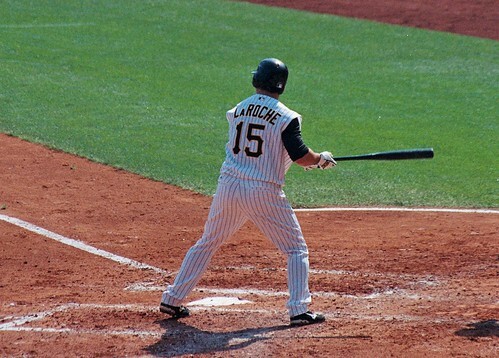 LaRoche was able to receive a lot of playing time for the rest of the season thanks to the fragile Nomar Garciaparra breaking down over the final month of the season. It seemed as if LaRoche would finally receive his time to shine heading into 2008. Heading into spring training for the 2008 season, LaRoche would compete for the third base job with the veteran Garciaparra. One player was looking to get his career started while the other was trying to get it restarted. Then on March 7, Nomar was hit by a pitch on his wrist which would force him from the game. Not that you ever wish injury on a player, but it seemed as if it was LaRoche’s turn to shine with his only real competition out of the picture. I remember reading about this game after the fact and knowing Nomar’s frailty issues, knowing he would most certainly be spending time on the DL. But LaRoche’s “luck” wouldn’t last very long as the next inning he himself would experience a horrible injury as he tore his ulnar collateral ligament off the base of his thumb on his throwing hand as a pickoff throw deflected off a player and hit his hand. To say this was a freak accident is an understatement. Fans in Pittsburgh will be happy with LaRoche (wallyg/Flickr). LaRoche would of course be put on the DL right next to Nomar and would have surgery to reconnect the ligament. After nearly two months of recovery, he would spend a short rehab stint in AA and AAA. While I was anxious to have LaRoche back from his injury, the Dodgers apparently were not quite as much as he once again was slighted and optioned back to AAA. The Dodgers instead decided to back Blake DeWitt as their everyday guy which confused me a great deal as DeWitt was nothing special. It baffled me that the Dodgers decided not to go with LaRoche – the superior player – now that he was back. It soon became clear to me why. While LaRoche did get recalled on June 10, it was in more of a utility role as he spent a lot of time at first base rather than his normal third base position. It was becoming clear that LaRoche wasn’t really in the long-term plans for the Dodgers. Then on July 31, LaRoche was reunited with his brother Adam as he was traded to the Pittsburgh Pirates with pitcher Bryan Morris as part of the huge Manny Ramirez/Jason Bay trade. As a distant Pirates fan, I couldn’t have been happier with the deal. LaRoche was finally going to be part of an organization that would give him an opportunity to play and wouldn’t be held back any longer by the oppressive Dodgers. What he really needed was a chance to establish himself and get comfortable at the major league level so that he could translate his success from the minors to the big leagues. LaRoche ended up struggling the remainder of the season with his new club as the lasting effects of his injured finger appeared to linger and he never seemed to get comfortable at the plate. While his struggles have caused some to doubt his abilities, I still stand strong that his ability to drive the ball and get on base will translate to the majors now that he is healthy and has the opportunity to be the everyday starting third baseman. LaRoche just needs to rebuild his confidence in his ability (which he himself has said has dwindled since all of this has happened) and Pittsburgh is the perfect low-pressure market to do this in. It has to be. After all, we both have a lot invested in his success. Well I guess he has a little more than I do. You are currently browsing the The Diamond Cutter blog archives for the day Wednesday, February 4th, 2009.